I’ve ripped maple lumber for gluing up as a worbench top. 2” x 3” and 1” x 3” pieces. I don’t have a jointer but do have a thickness planer and a router. Not sure how much correction of warping etc I need to address before glue up. There is warping and some twisting which seems to mostly correct when I dry clamp. Also, from what I just read on the LJ site I’m thinking it would smart to attach cross pieces of angle iron underneath to inhibit wood movement later on. Pointers for a beginner will be greatly appreciated. If the pieces straighten out under clamping without too much force, then you are good. Glue up sections that will still run through the planer, square and flatten those and then glue them together for the final top. That will save some time and effort later. Not sure what you read, but you are not going to inhibit seasonal wood movement, it needs allowed for it in the construction. Trying to stop wood movement inevitably leads to splitting and separation. The only times I’ve seen angle iron used, it was on tables to help keep the top flat and holes were slotted to allow for seasonal expansion and contraction. A 3in thick laminated top isn’t going to cup or bow like a thin table top can. Leave the lumber alone for close to a week after the ripping to acclimate. After that I would take as much warping and twist out with a planner sled since you dont have a jointer. Just google how to make one. This is assuming the maple was properly dried before you started ripping. Good luck. Cauls help during the glue up to keep panels and tops flat. Like jayt said. You can inhibit flex but not expansion/contraction. The amount of force wood can exert in expansion and contraction is truly amazing. If you try to retard it with metal bracing, the wood will expand in the other direction and/or crack and split. You don’t necessarily need to start with a completely flat bench, but you need a way to flatten it after assembly if you can’t get it flat-ish to start with. That could be a hand plane (relatively easy though time consuming), a belt sander (ditto), or a wide belt sander (expensive, but possible to take the slab to a shop to have them sand it), or some sort of router jig (difficult). With a planer, you can use a sled to flatten sub assemblies of the bench (a foot at a time). You’d want to use a piece of MDF or particle board and some hot glue or affixed shims to get the board supported. With the flat bottom of the sled, you’d end up with a flat face on the sub assembly, which you can then turn over and flatten the other face by running it through the planer directly. Writ large this site serves as a model for achieving a lot of good in our family/neighborhood/ community/society/nation/world. What they said: trying to stop wood movement is a bad (really bad) idea. But some more thing to think about…I did this exact thing about 3 years, the same wood and method. Mine was a little longer (80”) but handling the section was a real job. In total my top weighs in the neighborhood of 200#, and there is only me in my shop to handle it. 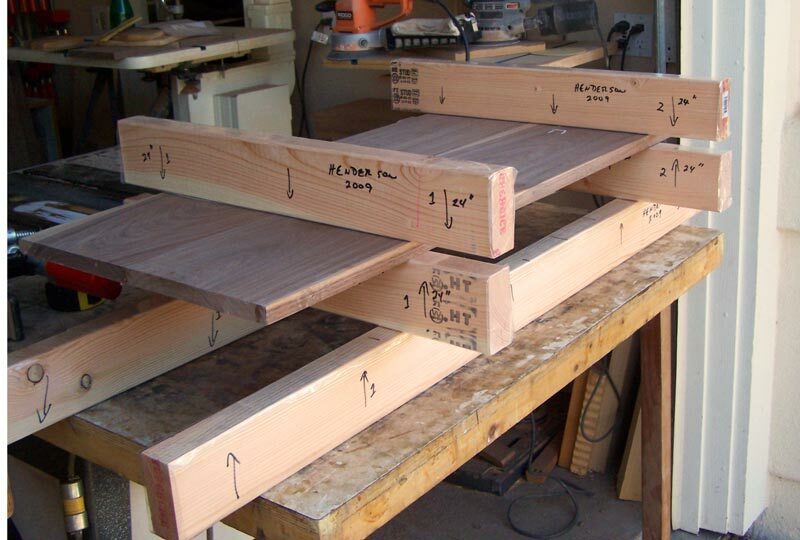 I first glued up 3 10” wide sections (70# each) and then assembled them into the top. Point being: be sure to think through how you handle this as the glue up progresses, it can get fairly heavy quickly. I used a hydraulic lift table to get mine into place on the bench legs.